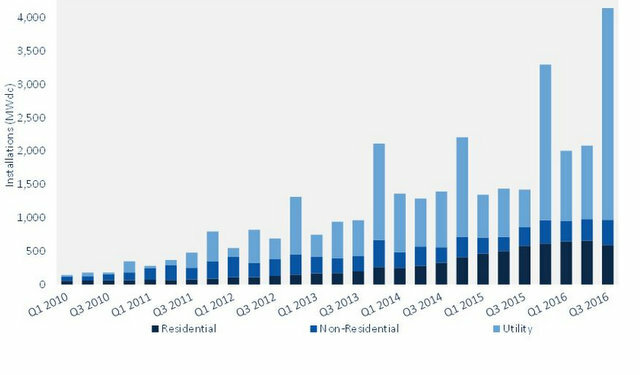 The United States solar market just shattered all previous quarterly solar photovoltaic installation records. 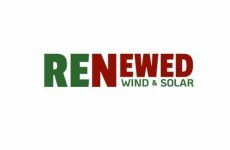 According to GTM Research and the Solar Energy Industries Association’s (SEIA) Q4 2016 U.S. Solar Market Insight report, 4,143 megawatts (MW) of solar PV were installed in the U.S. in the third quarter of the year, a rate of one MW every 32 minutes. That pace is even faster today, as the fourth quarter will surpass this past quarter’s historic total. This may depend on the segment you serve. The report points to an “unprecedented rate of project completion” in the utility-scale segment as a key growth driver. In fact, the utility-scale segment represented 77 percent of solar PV installed in the third quarter of the year. GTM Research anticipates that a massive 4.8 GW of utility PV projects will come on-line in the fourth quarter of the year – that’s more than was installed across the entire utility PV segment in all of 2015. “Driven by a large pipeline of utility PV projects initially procured under the assumption of a 2016 federal ITC expiration, the third quarter of 2016 represents the first phase of this massive wave of project completion – a trend that will continue well into the first half of 2017,” said Cory Honeyman, associate director of U.S. solar at GTM Research. The non-residential segment posted its second largest quarter ever. With 375 MW installed, the segment grew 15 percent over the second quarter of the year and 37 percent annually. Part of this growth is attributed to a community solar pipeline that is finally beginning to materialize, a segment that accounted for a record 20 percent of the non-residential PV market in Q3 2016. 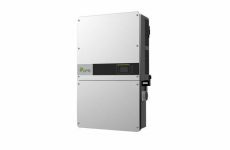 This past quarter marks the sixth consecutive quarter in which more than a half GW of residential PV was installed; however, the segment is experiencing a slowdown from its peak growth quarters. The residential PV segment grew just 2 percent year-over-year and actually fell 10 percent from last quarter’s total. The report cites changes in the sales cycles in mature state markets, like California, and challenges posed by rate design reform, such as the elimination of net metering in Nevada, as reasons for the shift. A mere three years ago, the United States eclipsed 10 cumulative GW of PV installed. By the end of 2016, GTM Research forecasts the United States to install 14.1 GW this year alone, up 88 percent over 2015’s total.